Composed by Santino Cara. Opera. Sheet Music Single, Solo Part. 18 pages. Santino Cara #CS222. Published by Santino Cara (S0.5517). 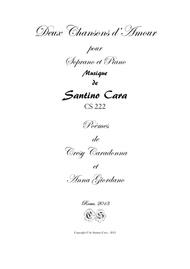 "Deux Chansons d'Amour" for Soprano and Piano - Op CS222Composed in Rome in 2013 - "Vol d'étoiles" Text Cresy. 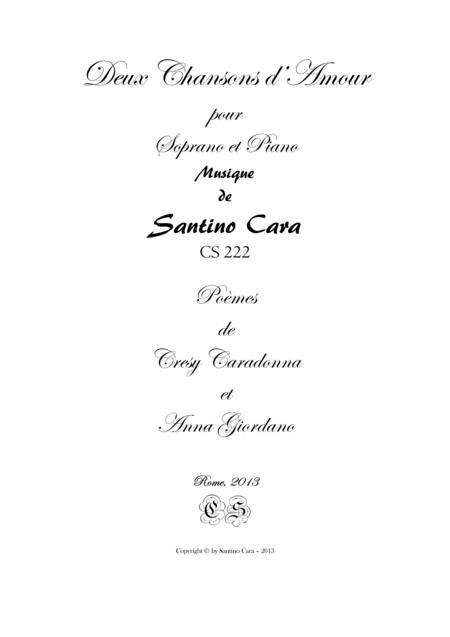 Caradonna and Music by Santino Cara - "Pour ..." Text Anna Giordano and Music by Santino Cara.